It’s been a busy few weeks for those who wish to explain the role of primates in research. Last week the NIH held a workshop on “Ensuring the Continued Responsible Oversight of Research with Non-Human Primates” (watch it back here). The Congressionally mandated workshop resulted from report language that was associated with a PETA campaign. PETA hoped the workshop would question whether primates should be used in research at all. Instead PETA were disappointed when many experts came together to talk about how primates remained important to medical and scientific research. Days before the event, PETA activist, Professor John Gluck, wrote to the New York Times to criticise the use of primates in research. Speaking of Research posted a response – “The ethics and value of responsible animal research” – that was signed by over 100 scientists. Other organisations have subsequently written back to the newspaper with letters published this week. The paper (by Bailey & Taylor, 2016) itself suggests that several medical advances – such as Deep Brain Stimulation – did not rely on animal studies. This would not seem to match what can be seen in the academic literature, indeed Alim Benabid, who won a Lasker Award for his role in developing the technique noted the important role of animal models, including primates. There are many other events which have played into a frustration by primate researchers, but the response was huge. Understanding Animal Research coordinated a letter on the role of primates in research. Within a few days hundreds of primate researchers and neuroscientists had signed up. 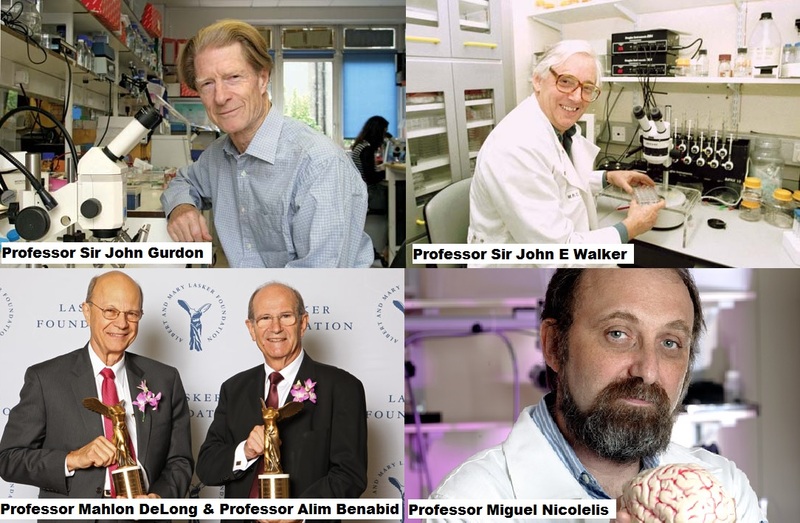 Notable signatories included: Sir John Gurdon, who won the 2012 Nobel Prize in Physiology or Medicine, and the 2009 Albert Lasker Basic Medical Research Award, for their work in reprogramming mature cells into early stem cells; Sir John E Walker, who won the 1997 Nobel Prize in Chemistry for elucidating the mechanisms behind the synthesis of ATP; Professor Mahlon DeLong and Alim Benabid, who jointly won the 2014 Lasker-DeBakey Clinical Medical Research Award for their research developing Deep Brain Stimulation as a surgical treatment for Parkinson’s (the same discovery that the Bailey & Taylor, 2016, paper suggested did not require primates); and Professor Miguel Nicolelis, whose Walk Again project allowed a young paraplegic in an exo-skeleton to kick a football. Over twenty organisations, including Speaking of Research, the Society for Neuroscience (SFN), and the American Psychological Association (APA) signed their support ( a full list of signatories can be found here). The letter was published by the UK newspaper, The Guardian, on 13th September (and the following day in print), along with an accompanying article. The biological similarities between humans and other primates means that they are sometimes the only effective model for complex neurodegenerative diseases such as Parkinson’s. More than ten million people suffer from Parkinson’s worldwide, and a recent study estimated that one in three people born in 2015 will develop dementia in their lifetime. Primate research offers treatments, and hope for future treatments, to patients and their families. Already over two hundred thousand Parkinson’s patients have had their life dramatically improved thanks to Deep Brain Stimulation surgery, which reduces the tremors of sufferers. This treatment was developed from research carried out in a few hundred monkeys in the 1980-90s. Get involved – show your support! While, the letter itself is published. Understanding Animal Research are continuing the accept signatories from neuroscientists and primate researchers (signatories must be from academia and must hold a PhD, MD or equivalent). These are being updated on a regular basis on their website. Already they are up to over 550 signatories – just one week after they started collecting (considerably more than the 21 signatories that Cruelty Free International managed in their letter, and with a lot more expertise in the area of Neuroscience). Posted on September 15, 2016 September 15, 2016 by EditorPosted in Campus Activism, News, Outreach News, SR NewsTagged cruelty free international, letter, neuroscience, primate research. I am sharing this article on facebook and urging others to spread the word. Thanks for a very insightful and informative article. Primate Researchers are in defense, not “defence”, of their jobs. The day is near, and here (chimps), where primate research is no longer viable. The Gen Xers, Millenials , and those yet to come will step up to the plate. Using technology, they will produce multitudes of helpful models to alleviate disease in humans. Their insight will be necessary, and they will rise to the challenge. The progress will be astounding. Without vivisection, compassionate science will benefit one and all. And it’s just around the corner. This article was written in British English (as many SR articles are, so spelling is correct). 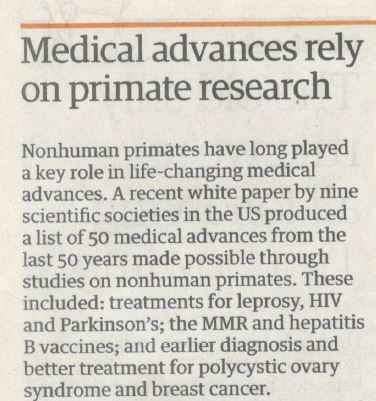 If we didn’t *need* to use primates for medical and scientific research today would be great, but it’s not the case at the moment. I hope great new technologies come about, but most people cannot afford to give up on medical advances in the meantime.